There are hundreds of ways to decorate your Easter eggs every year, but how does one choose?! We have curated several ideas that we are especially excited about after spending an embarassing amount of time searching all over the internet for you awesome hostesses and hosts. Take a few minutes below to see if any of these inspirations fit to your Easter vision. And as always, we know time is precious so we have odered these ideas from least to most time consuming…hopefully this also saves you a few minutes of scrolling! We love the simplicity and look of this idea from Madeline Bachelder on Brit+Co. While our music festival attendance has dwindled with age, we still have the odd flash tattoo sheet hiding in our various junk drawers. If you didn’t happen go through this phase, don’t worry, there are tons of affordable options online to buy brand new flash tattoos. A quick google search for “flash tattoos” should give you plenty of results and you can search for the theme that best fits your party decor. If you haven’t noticed, here at Confete we are big fans of hints of sparkle and shine throughout a party. So when we spotted these pink and gold eggs over on Oh So Beautiful Paper, we knew they needed a spot on our page. The writer recommends Wilton Gold Shimmering Food Color Spray which it looks like is available at craft shops as well as online. We have a confession, we NEVER use every last drop of our nail polish before they go bad. So why not put a few of those typically wasted drops to use on our Easter eggs?! Sara Albers posted this genius idea on Alice & Lois and we are head over heels for it. Her post sticks to one hue, but we are pretty confident this would look great with any color you have sitting at home, or get a little wild and mix several colors! This idea came to us from Parents and is definitely something we can get the kids involved with. It can double as a learning opportunity for your little ones as they watch how dilution effects pigementation…whoa excuse us for nerding out for a moment with our verbage! Perhaps its best to just tell the mini experimentors that as you add more water to the dye, the color on the egg gets lighter! When you find a decoration that includes the company namesake, it becomes the “must” trend of the party. Fellow party enthusiast Kelly, runs a website called Studio DIY which is where we found these perfectly glittered eggs. They are super simple to make, but do require a few supplies and steps, which is why they are further down the list. Why buy dye when you can buy food?! 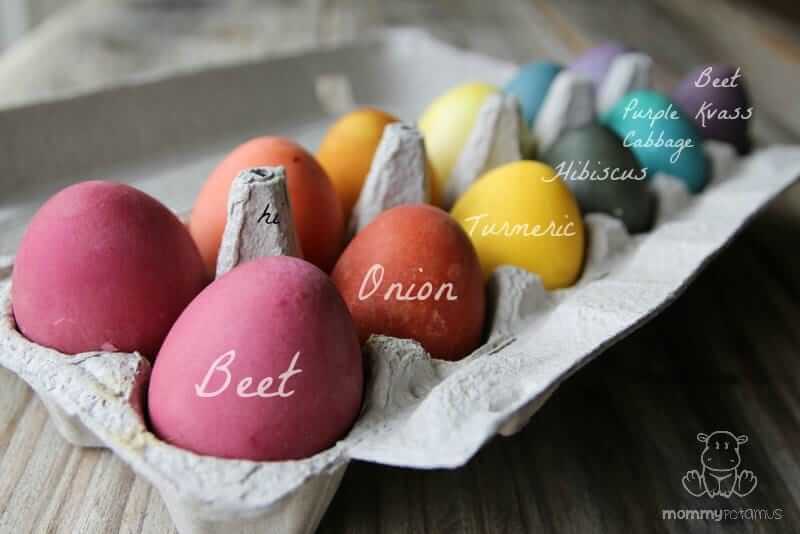 We love this concept of creating your own egg dye at home from what you have sitting around in the kitchen. Heather over on MommyPotamus has sparked our healthy lifestyle inspiration with her post about making your own dye by boiling fruits and veggies. To go full eco-mama you can even try to use food scraps to make the dyes and give them one more use before hitting the compost bin. We will feel totally confident serving the hard-boiled treats inside these pretty shells once the party is over and feel good about reusing those wasted apple peels or onion skins. Welcome to the Party Maddi!